Real Journey Time, Real City Size, and the disappearing productivity puzzle. For a year we’ve been tracking most of the buses and trams in The West Midlands; the UK city region centred on Birmingham. We do it by polling the live departure screens that you see at bus stops, even at stops where they aren’t installed. So far we’ve recorded 40 million bus departures, a total of 16GB of data. And we’ve written tools to explore it in seconds. You can try for yourself at www.realjourneytime.co.uk. You can see how long every bus took to connect any two bus stops anywhere in The West Midlands, and calculate averages over tens of thousands of bus journeys at specific times, to see how bus journey times change over the course of a typical day. Agglomeration: Big cities are more productive. We’ve mostly done this work because of the following graph. Many economists argue that larger cities are more productive than smaller cities, and become ever more productive as they grow due to something called agglomeration benefits. There are many other factors that contribute to productivity, but this simple law seems to hold well in economies like The USA, Germany, France, and The Netherlands. For example, Lyon, the second largest city in France, is more productive than Marseille, the third largest city, which is in turn more productive than Lille. Almost uniquely among large developed countries, this pattern does not hold in the UK. The UK’s large cities see no significant benefit to productivity from size, especially when we exclude the capital. 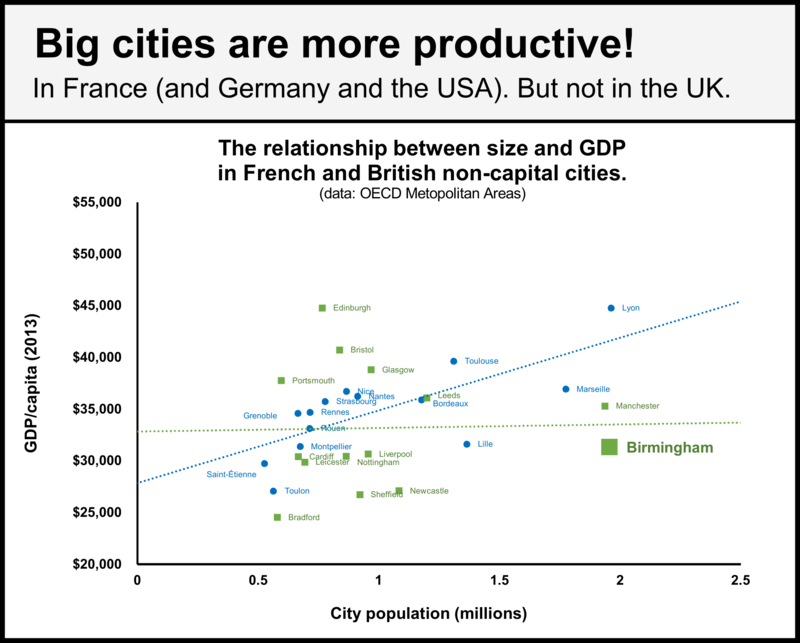 The result is that our biggest non-capital cities, Manchester and Birmingham, are significantly less productive than almost all similar-sized cities in Europe, and less productive than much smaller cities such as Edinburgh, Oxford, and Bristol. Public transport and city size. One notable difference between the UK’s large cities and those in similar countries is how little public transport infrastructure they have. While France’s second, third, and fourth cities have 8 Metro lines between them (four in Lyon, two each in Marseille and Lille) the UK’s equivalents have none. 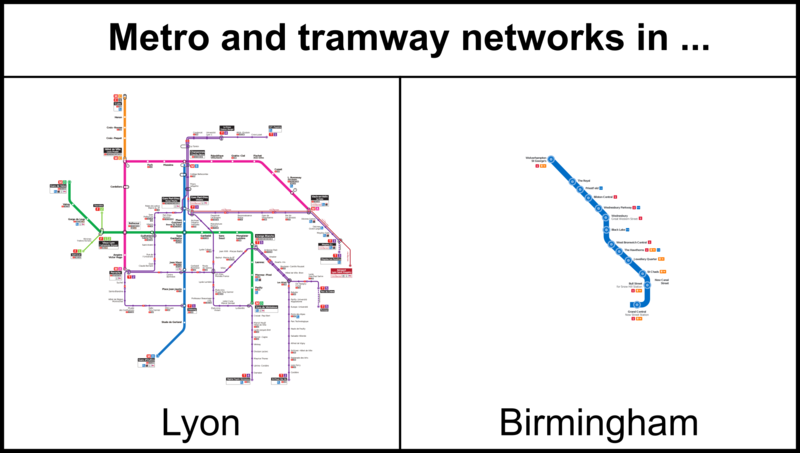 Manchester and Lyon have similar-sized tramway systems, with about 100 stations each, but Marseille (3 lines) and Lille (2 lines) have substantially more than Birmingham (1 line) and Leeds (0 lines). Is it possible that poor public transport in the UK’s large cities makes their effective size smaller, and thus sacrifices the agglomeration benefits we would expect from their population? Our Real Journey Time data lets us ask this question. Real journey time, and journey time variability. There is an important difference between bus public transport and fixed infrastructure public transport: reliability. 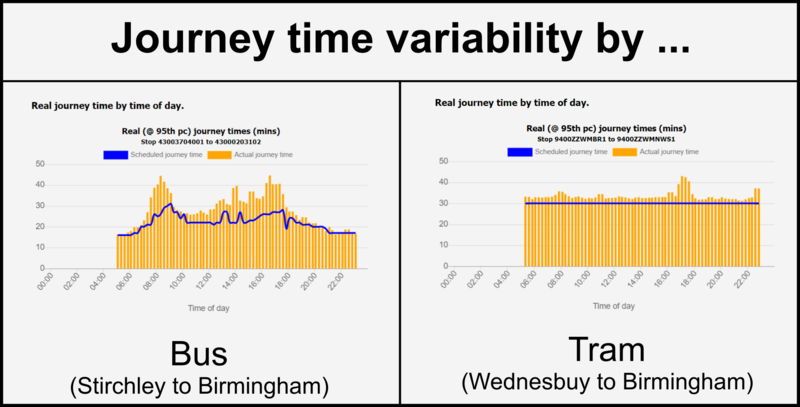 I have used our Real Journey Time tool to calculate the worst-case (95th percentile) journey time on public transport on two routes into Birmingham. This is the time that a public transport user must leave for their journey to ensure that they are only late for work or a meeting once a month. The first journey is a bus from the South of the city, Stirchley to Birmingham. This 3.5 mile journey takes about 20 minutes between 6am and 7am, and about 40 minutes between 8am and 9am. The second journey is a tram from West Bromwich to Birmingham. This 8.5 mile journey takes 30 minutes regardless of when it is taken, as the tram route is almost completely segregated from traffic. While the tram is substantially quicker at all times than the bus, the reliability of its timing, even during the most congested periods, provides an additional large benefit to users. We think that people generate the most agglomeration benefits for a city when they travel at peak times, to get to and from work, meetings, and social events. Our tool shows us that at the times when people need to travel in order to generate these benefits, buses are extremely slow. And since buses are by far the largest mode of public transport in Birmingham this is likely to have significantly higher impact on Birmingham than in Lyon where the largest mode of public transport is the metro, which delivers reliable journey times no matter the time of day. Our hypothesis is that Birmingham’s reliance on buses makes its effective population much smaller than its real population. This reduces its productivity by sacrificing agglomeration benefits. For the past six months, using our Real Journey Time tool, we’ve worked with The Productivity Insights Network to quantify that. At peak times, Birmingham is a small city. The technique is quite simple. We pick 30 minutes as the travel time by bus that marks the boundary of the Birmingham agglomeration. This doesn’t include walking at either end of a journey, or waiting time, so this figure may well mean a 50 minute total journey. We then use our real journey time to examine how far from central Birmingham that allowed journey time would let a person live. For example, by examining six months of journeys on the buses we calculate that at off-peak times a person 5 miles from Birmingham in West Bromwich is part of the Birmingham agglomeration. At peak times, this is no longer the case and the outer boundary of the Birmingham agglomeration is reduced in size to just 3.5 miles away in Smethwick. Making use of our data on trams we can also imagine a Birmingham where major bus routes are replaced by trams and enjoy fast and reliable journey durations, even at peak times. This then includes people as far away as Bilston, 9 miles away. By repeating this process for bus route into Birmingham from every direction we create a boundary of the effective size of Birmingham at different times of the day. 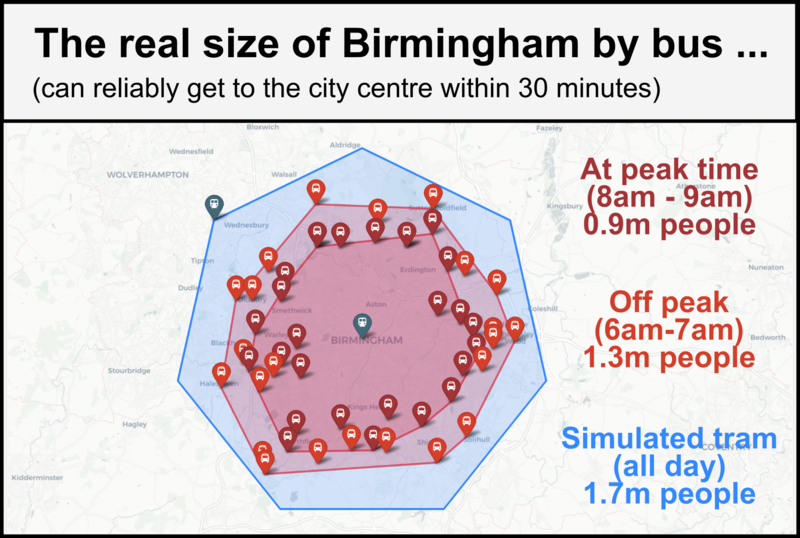 By summing the population living within each boundary we calculate the real size of Birmingham under three conditions. By bus at peak time, by bus at off-peak time, and in an imaginary future where all buses travelled as quickly and reliably as trams (simulated tram). At this point you might see why we picked 30 minutes as our travel time. Allowing 30 minutes of travel time using fixed infrastructure such as a tram gives Birmingham a population of about 1.7 million people. Which is very close to its population as defined by the OECD of about 1.9 million. But at peak time Birmingham’s effective population is just 0.9m, less than half the population that the OECD use. 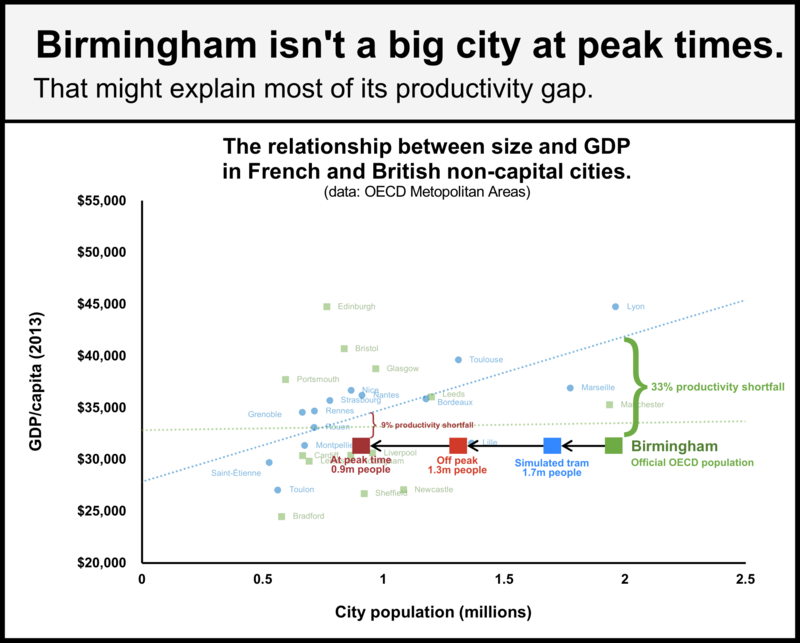 Birmingham’s effective size might explain most of its productivity gap. This is where things get very interesting. If we consider that Birmingham has a population of 1.9 million, and we assume that agglomeration benefits should work in the UK to the same extent that they work in France, Birmingham has a 33% productivity shortfall. This underperformance of the UK’s large cities is part of the productivity puzzle that UK economists have been desperately trying to solve. But once you understand that Birmingham’s real size is much smaller, below 1 million people, the productivity shortfall reduces to just 9% and is no longer significant. Our hypothesis is that by relying on buses that get caught in congestion at peak times for public transport, Birmingham sacrifices significant size and thus agglomeration benefits to cities like Lyon, which rely on trams and metros. This is based on our calculations that a whole-city tramway system for Birmingham would deliver an effective size roughly equal to the OECD-defined population. This difference seems to explain a significant proportion of the productivity gap between UK large cities and their European equivalents. The good news is that Birmingham’s current plans for transport investment are aimed at increasing its effective size at peak times. • Using our Real Journey Time tool, TfWM are targeting investment in bus lanes and bus priority measures to improve journey speed and journey reliability on existing bus routes. • Seven sprint bus routes are being planned, with bus priority measures hopefully delivering journey time reliability similar to a tram. • Two tram extensions (to Wolverhampton Train station and Edgbaston) are under construction, with two more (to Dudley and Birmingham Airport) under study. • Station re-openings at places like Moseley and Kings Heath will offer reliable journeys by rail to new areas of the city. The prize for achieving this is large. If bus journey times became as reliable at peak time as they are off peak the effective population of Birmingham would increase from 0.9m to 1.3m. If we assume that agglomeration benefits in the UK are as significant as in France, this would lead to an increase in GDP/capita of 7%. We have a reached a good point to share our work, but this is just the beginning. • We are continuing to improve our codebase to ensure that it can handle up to 200 million stored bus and tram departure times. • We are looking to incorporate trains into our tool, which will boost Birmingham’s effective size, though not by much. • We are continuing to work with The Data Science Campus at The Office for National Statistics and Transport for The West Midlands on strengthening our methodology for calculating travel isochrones. • We have already expanded our service to another UK city and continue to search for more, the sole requirement is an open bus departure API that reports a unique ID for each bus. • We are working to bring our technique to a French city, probably Lyon or Lille, in order to check that the increased amount of fixed public transport infrastructure does make their effective size larger than Birmingham’s. How was this work made possible. The project was delivered by Open Transport North, working with The Open Data Institute Leeds. This work was inspired by a Birmingham City Council hack event run by Deft 153 held in 2016 at Innovation Birmingham and made possible by the Transport for The West Midlands API, which almost uniquely allows the tracking of individual vehicles. Development has been funded and supported by Transport for The West Midlands, working with The West Midlands Bus Alliance, including National Express. Funding for the development of a method for estimating the economic impact from increased bus journey times was provided by The Productivity Insights Network (an Economic and Social Research Council investment) with specific guidance provided by Professor Iain Docherty of The University of Glasgow. Additional support and inspiration has been provided by The Office for National Statistics Open Data Campus, Transport API, The Open Data Institute, and Nesta. Read about our other funded projects. The Productivity Insights Network+ aims to rethink the productivity issues facing the UK and develop new insights through a place-based lens.